All seats are reserved. However, if you didn't get a chance to reserve a seat, we will have a rush line and we encourage you to come. Doors open at 12:30. Empty seats will be released at 12:50pm. Directed by Bonni Cohen and Jon Shenk. USA. 2017. 98 min. Admission: Free, but you still need to get a ticket. Reserve a spot through the drop down menu above. It’s been a decade since An Inconvenient Truth brought the climate crisis into the heart of popular culture. 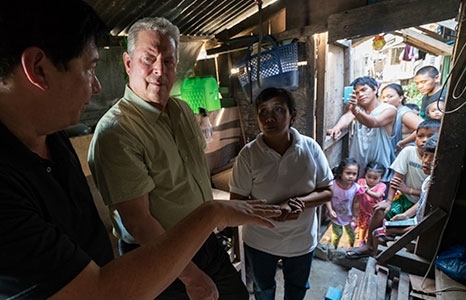 In that time, former Vice President Al Gore has continued his fight, traveling around the world training an army of climate champions and influencing international climate policy. Now comes the riveting, rousing follow-up that reveals some heartening news—we are close to a real energy revolution. Cameras follow him behind the scenes—in moments both private and public, funny and poignant—as he pursues the inspirational idea that while the stakes have never been higher, the perils of climate change can be overcome with human ingenuity and passion. Special guests: In partnership with Honolulu Civil Beat, join us for a post-screening panel discussion with environmental scientists and educators who will address how current climate change issues affect Hawai’i—moderated by Patti Epler, Editor and General Manager of Honolulu Civil Beat.